Thanksgiving is a special holiday for many. Families from all over the country come home to celebrate family and delicious food. All across Maine you’ll find plenty of events from Black Friday shopping to Turkey Trots to volunteer opportunities. No matter how you like to celebrate, remember that Maine is a great place to be. Many bars, especially in Portland’s Old Port, will be hopping on the Wednesday before Thanksgiving with people home for the holidays. Popular from college students to retires, you never know who you may run into the night before Thanksgiving. Bull Feeney’s is a popular Irish pub in the heart of the Old Port that is a great place to meet your long-lost friends for a pint and some music. Rated as one of the best bakeries in Portland by Food & Wine, Bon Appetite Magazine, and more, after the first bite of your pie you’ll see why it’s so good. Two Fat Cats Bakery is dedicated to baking all their baked goods from scratch. You can order pies by phone or in person for pick up during the week of Thanksgiving. You’ll find classic pies like apple, pumpkin and chocolate cream as well as other goodies like pumpkin roll with brown butter cream cheese filling and buttermilk biscuits on their Thanksgiving menu. Order early as they sell out fast. 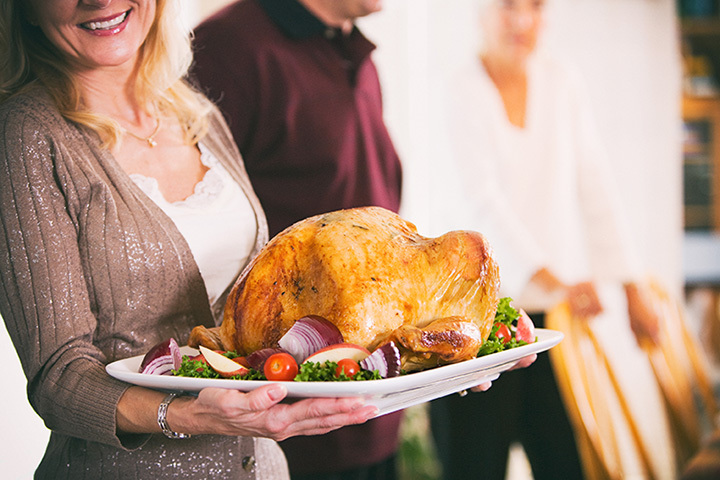 Skip the Butterball Turkey at the grocery store and buy locally. Pine Tree in New Sharon raises turkeys from day one in a healthy sustainable manner. All their turkeys are free range and do not use antibiotics or hormones. You can purchase their turkeys at this farm store in New Sharon or a variety of stores from Shapleigh to Bar Harbor. What’s Thanksgiving without a little Black Friday shopping? Head to Freeport where L.L. Bean is open 24/7 even on the holiday and the outlet stores will open bright and early for a weekend full of incredible discounts and fun events. You’ll find shops like J. Crew Factory, Vineyard Vines, Cuddledown, and more. On Thanksgiving Day, the Portland and Deering football teams will meet for the special game day at Fitzpatrick Stadium. The inter-city rivals have been playing this popular exhibition game since 1911 and have played every year with the except of 1920 when the weather made the game unplayable. Back in the 1950s, the games would draw crowds up to 13,000 people. Portland currently leads the series at 58-40-7. While many people think that Thanksgiving is all about the food, football, and shopping, it’s important to remember America’s indigenous people were negatively affected by the new settlers. The Abbe Museum in downtown Bar Harbor displays dynamic exhibitions showcasing the history and cultures of Maine’s Native people, the Wabanaki. For 36 years, the Portland Thanksgiving Day 4-Miler has been a Southern Maine tradition. The two-loop course winds through the city’s downtown. This year’s race will support the USM Women’s Track team, the Rafiki Foundation, Portland Trails, and Partners for World Health. While costumes aren’t required, you’ll find many turkeys and pilgrims running this event. Not everyone is so fortunate to have food and shelter over the holidays. Wayside kitchen and food pantry helps people and family daily. During the Thanksgiving week, Wayside has several ways to help families in need. Prior to Thanksgiving Day, you can donate a turkey that will be distributed throughout Cumberland County or you can help cook all the food the day before Thanksgiving. Not celebrating this year? Help the United Way of Greater Portland and Black Tie Catering to serve a delicious Thanksgiving dinner to the community. Christmas Prelude in Kennebunkport starts the weekend after Thanksgiving. Named the No. 2 Christmas Town in America by HGTV, you don’t want to miss this celebrate with 12 days of events from parades to Christmas tree lights to arts and crafts fairs and more. Each day as a host of events and many local civic, school, and church groups use Prelude to fundraise for the year. The Saco Turkey Trot offers up four events for walkers and runner. Children will enjoy the Tot Trot while older kids and adults with like the 5K or 10K run or 5K walk. Now in its third year, the Saco Turkey Trot is one of the city’s biggest events. Costumes are encouraged and there is even a special prize for the best costume.